This is a post I’ve been meaning to write for a long time; What is River Restoration? I’ve started, abandoned, rewritten and gone off on tangents with it a dozen times as although it seems a simple question it touches on a number of issues such as why restoration happens (see previous blog post in this series) and which methods/techniques are most suitable. I was not able to find any definition on the River Restoration Website and the Wikipedia entry is decidedly vague, although does make useful distinctions with river engineering. This is a very complex issue as it relates partly to context and partly to a whole lot of jargon and semantics. I’m going to explain first the context of why someone might consider river restoration and then uncritically explore the different sub-types of restoration as I see them, before trying to explain why this all matters. In its most basic form river restoration is taking a river channel which is deemed to be degraded in some way and attempting to improve the status of the river through some form of intervention such that the degradation is reversed or minimised. I have chosen a deliberately broad definition as there are a very broad range of projects under the umbrella of “river restoration” and my objective is to shed some light on the area whilst avoiding semantic debates. Indeed there can be a good case made that some projects that would in the past have been labelled river engineering are now talked of under the umbrella of river restoration as it sounds less invasive. Broadly speaking river restoration is deemed necessary or worthwhile where there is a legacy of human river modification. This modification could be direct such as dredging, or indirect such as agricultural practices increasing sediment delivery, but generally the river in question has been altered in some way from its “pre-human” state. Previous river modification may have altered the processes within the river such that the way the river looks, behaves, or functions is not meeting societal expectations (e.g. local people, river uses, legislators, etc). The term “restoration” implies moving something backwards towards a pre-existing state. You may think this means “river restoration” would involve assessing how the river used to look and function and recreating this; however in reality “river restoration” has become an industry term which encompasses virtually any work on a river which aims to improve something about the river. Perhaps “river restoration” should therefore properly be referred to as “river improvement”, but this raises a further semantic question; improvement from who’s point of view? We can sub-divide types of “river restoration” to help shed some light on what is going on. The first type I’d define is actual “restoration”. This involves detailed assessments of how the river would have appeared and functioned at some imagined-Neolithic point in time; the objective being to recreate the river as it was before any human intervention. In practice this is usually impossible to achieve due to the difficulty in defining the target state of the river. Maps don’t go back far enough and although it is sometimes possible to recreate the geomorphological evolution of the river through modelling or sub-surface mapping, and the ecological composition of the environment through coring, such an exercise is usually beyond the scope of most projects. Furthermore it is exceptionally challenging to remodel a river in terms of its planform and ecosystem. The second type I would define as “re-creation” this is where the target river has been subject to a clearly definable historic phase of degradation, typically short and largely geomorphological, for example channelization or installation of a weir. The restoration works aim to recreate the river morphology pre-degradation through study of historic maps and topography. This may or may not be linked to an attempt to improve the ecology of the river, however this type of restoration can occasionally be ‘for its own sake’; that is to say something has been done to the river, it is perceived as a historical mistake and thus an attempt to reverse it is undertaken to make the river more “natural”, the actual outcomes are almost secondary. The third type is “rehabilitation” where (usually) small scale processes or features are identified as absent or degraded in the target river; typically this will involve insufficient habitat for one or more species or groups of interest (e.g. salmon).The restoration works aim to improve the processes or features in question by manipulating the system in small way. This is probably the category with the widest applications and encompasses the vast majority of “river restoration” occurring around the world in terms of number of projects. Examples could include inserting dead wood into a channel to provide habitats, planting vegetation strips along the river bank to catch fine sediment laden runoff and adding gravels to a channel to raise the bed-level. Such works are highly local in effects, of fairly short term duration (perhaps just a few years at best), and are rarely monitored to determine success; indeed in some cases the actual desired outcomes are not clearly defined in the first instance. Implementation is often led by industry experts who have led many past projects and projects will often rely on such expert knowledge rather than detailed site assessment beforehand. The popularity of such projects is partly a result of their low cost, short led-time/preparation and they are a very pragmatic way of enhancing a river in the short/medium term. As you can see this is largely an issue of semantics, but it is important to be aware that river restoration may not involve any actual restoring, but rather general improvements to a degraded river. All of the above types of project have the potential to be beneficial, and each has their advantages and drawbacks. Although the precise definition of river restoration can seem like an abstract semantic argument I think it is important to be aware of the subtleties. If stakeholders better understand what sort of restoration is being conducted at a site then their expectations of improvements to the river can be tempered. 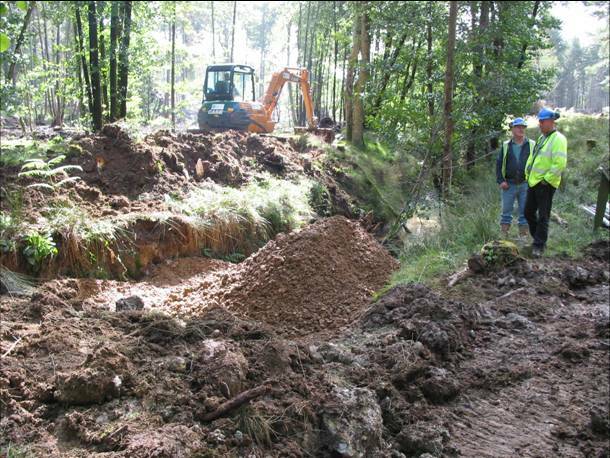 Problems will arise with public support of river restoration if people believe a project will deliver a SSSI graded wilderness stream where a scheme is just removing a weir! In any specific river it could well be the case that full system restoration is unrealistic (maybe over time a forest has been replaced by a town), re-creation maybe insufficient and rehabilitation possibly unsustainable. In such a case if stakeholders want improvements to the river a pragmatic solution will be needed and expectations should be tempered by reality and clearly understood by everyone with an interest in the river. In a future post in this loose series I intend to explore the arguments for and against catchment scale, process based restoration (full restoration above), often held up as an ideal in the scientific literature, but remaining relatively rare in practice. This entry was posted in Ecology, Geomorphology, River Management, River restoration, Water Framework Directive. Bookmark the permalink. 10 Responses to What is River Restoration? Great article – and something that crops up time and again when people talk of “restoring” rivers. You will find this URSULA presentation by Matt Kondolf of interest – particularly the first few concept diagrams of restoration approaches for urban rivers. Another interesting take on this division between paradigms of “river engineering” and “river restoration”: http://t.co/6RrLV9DYkz. I would say that the Thames is the most altered and spoiled river in Britain. Naviation needs dominate flood management and conservationn and fisheries. It is also the most difficult to change because of the structures. Link previous link should have been to this paper instead: http://t.co/YS70zrXa5G. It’s an ASCE talk on the roles of “river engineering” and “river restoration”, the different traditions, approaches, mindsets etc of these. Excellent article! The important points are clearly explained in detail especially on the different types of restoring the river. It is very helpful and thanks for the great post! Excellent article! Something we believe is key to all types of project whether it be restoration, re-creation or enhancement is understanding river processes and geomorphology. This is something we, as a specialist design/build contractor in the business, feel is key to delivering successful ‘river restoration’. It makes sense that river restoration is essentially helping a river get back to how it was because it is a little degraded. We have a few rivers near our house that could probably benefit from a little bit of work. Maybe we can talk to our mayor and see if he would help fund a river restoration service to come in and fix that all for us.